In our house, June not only marks the beginning of summer but the end of the school year. Things are slowly coming to a close in class and with only eight days left, there is much anticipation for the upcoming holidays. Throughout the year, my youngest has kept a reading log that I scrupulously kept updated my the minute (literally) with the goal being 2500 minutes for the year. Well, he made it and as a fun celebratory activity, his teacher had a baking party for the class and made these Simply Sensational Chocolate Chip Cookies. I made and baked these cookies the day he brought the recipe home. The only thing I would have liked to have had was more regular-sized chocolate chips. I had to use mini ones which was okay in a pinch. 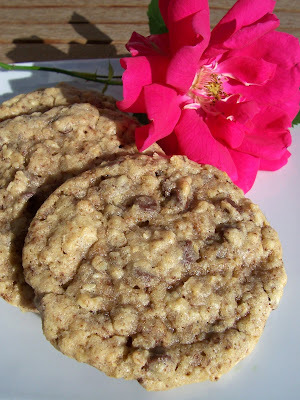 What I liked about these cookies was that the oatmeal was blended giving the cookies a smoother appearance, but still textured, and the addition of grated chocolate gave the cookies more flair. I would definitely make these cookies again with more chocolate. They were not flat nor too rounded and baked well even though I had to refrigerate some of the dough. Bake them longer for a crispier cookie but I like my cookies crisp on the edges and chewy on the inside. To make them even more fun for kids, use M & M's which is what I think I'll do next time. If you're looking for a simple and tasty cookie to have with tea, these jam cookies are for you. I intended to make these cookies with apricot jam, as the recipe suggests, but by the time I got around to making them, the apricot jam was gone and boysenberry had taken its place. This dark jam turned my cookie dough purple and I realized that, esthetically, a light-hued jam would have looked much better. Nevertheless, I made my purple cookies while the small people around me gave me their observations on what the dough looked like, which unfortunately I cannot reproduce here. Despite their wacky colour, the cookies came out just fine. They did not spread a lot and the dough was stiff enough that I was able to roll them into even-sized balls. They were soft with a cakey texture and not overly buttery, as their name suggests. They don't look glamorous but they're good for snacking. Give them a try with any jam of your choice.